Have a huge library of DVDs you’d like to save on your SSD or hard drive? Maybe you’re a collector and want to preserve the physical copies for as long as you can. Whether you’d like to backup a homemade DVD, a video recorded while on vacation, a timeless classic or new title you bought from a retail store, WinX DVD Ripper is the tool for the job. WinX DVD Ripper is today’s best DVD ripper and the only software boasting level-3 hardware acceleration to speed up the DVD to video conversion speed and balance the DVD video audio quality. Users can rip any DVD disc, ISO or DVD image to 390+ video formats, onto any hard drive, and get a perfect copy every time. What’s more, ripping content off and storing a digital copy foregoes the need to use your disc drive while watching, which can actually help extend the life of your computer and its components. Ready To Experience 50% Faster DVD Ripping Speeds? The software recognizes all formats, including DVD ISO, DVD Folder or DVD Disc. Got a TV series, movie, music DVD or workout DVDs you want to back up? Is your DVD unplayable, damaged or badly scratched? 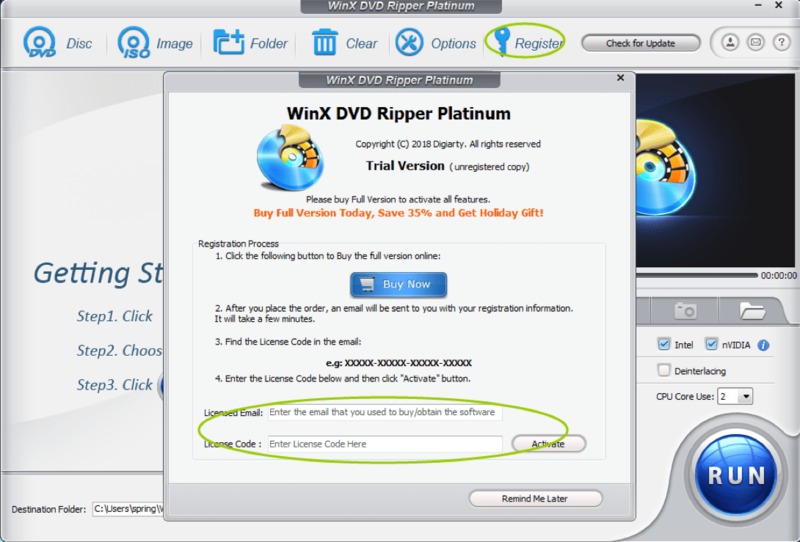 WinX DVD Ripper offers the ultimate solution. The newest DVD formats are those that have 99 Titles and ones that have a capacity of 40GB or more. Run-of-the-mill DVD rippers will freeze or cause system instability, but WinX DVD Ripper will recognize the format and the correct title- you’ll be able to obtain a perfect copy from the original. WinX comes with a built-in video editor you can use to trim, crop, merge or add SRT subs and polish it to a high shine. The backup DVD can be made compatible with the latest Android tablets, iPads and smart TVs. With WinX DVD Ripper, you can customize to your heart’s content. You can fine-tune, adjust and customize the many different parameters such as aspect ratio, sample rate, audio channel number, audio codec, frame rate and video audio codec to match your specifications. Back then, ripping a feature-length DVD would eat up approximately 45 minutes. Not anymore. WinX DVD Ripper’s distinguishing feature is its level 3 hardware acceleration. DVD rip speeds are improved by up to 50% while preserving the original video file size and output, and thereby minimizing strain on computer components. The Windows-based DVD Ripper boasts the lowest CPU usage among DVD ripping softwares. You can copy DVD to MP4 using a low-end computer in fast as 5 minutes. Don’t miss out on the opportunity to get the best DVD ripper for free! Click on the Register button inside the WinX DVD Ripper software. Enter the registration details from the Licensed Email and License Code accordingly. Go to WinXDVD homepage for your free rip DVD download. Install and open WinX DVD Ripper Platinum. Step 1 – Load your DVD. Insert the DVD you want to convert in the DVD tray. Click on “DVD Disc” and hit OK. If you’re trying to rip from a different source, choose “ISO Image” to load a DVD ISO image, or “Folder” to load up a DVD folder. 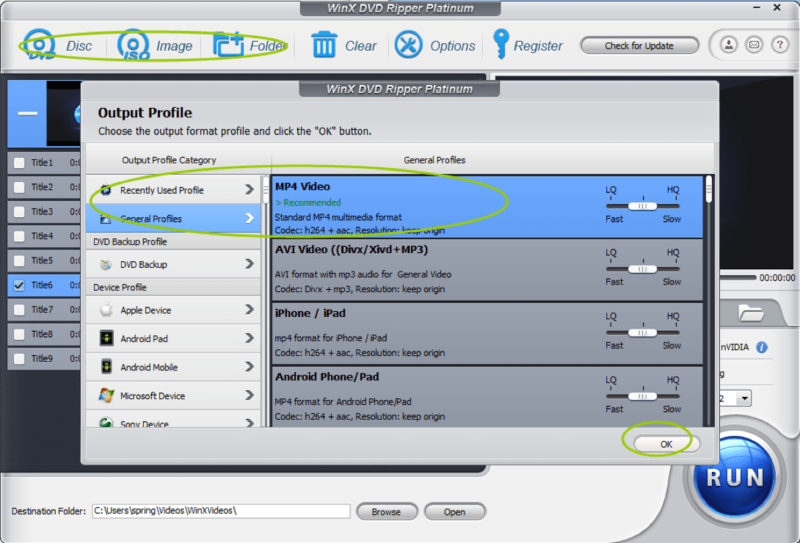 Step 2 – Choose MP4 as output format. Once the Output Profile comes up, you can choose between General Profiles such as iPhone video, Android video or YouTube video. Select MP4 video with codec: h264+aac then click on the OK button. Step 3 – Start Ripping. Browse to the destination folder where you’d like to save the new MP4 video. WinX free DVD ripper auto-enables hardware acceleration based on your GPU hardware. Click on Run to rip DVD and wait for the 5-minute conversion to finish.